Vazhaipoo, Banana Flower, as kids, most of us would have not liked this vegetable, because of it's slightly bitter taste, and now even my daughter never wants to have it. I usually add it while making adai ( vazhaipoo adai ), it tastes good in the adai. Very rarely I make a poriyal with it, I made this paruppu usili after a very long time. 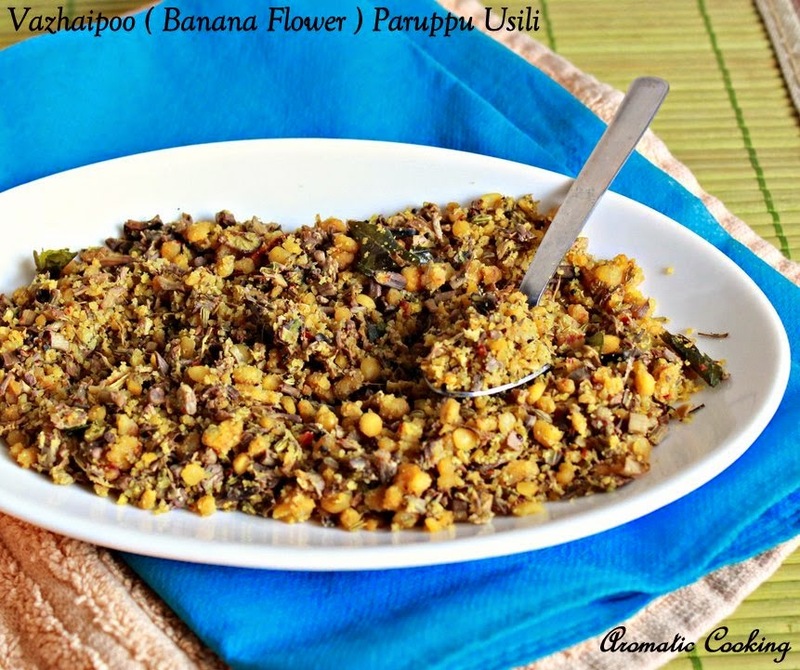 Again in this dish, since we are adding dal/ lentils along with the banana flower, it tastes really good. I have already posted a couple of usili recipes in my blog, Green Beans Paruppu Usili and Long Beans Masala Usili, there is a slight difference in the ingredients and also I had used the microwave in those recipes. For the vazhaipoo usili, I have done it in a pan on stove top, I feel this is the best way for this vegetable. 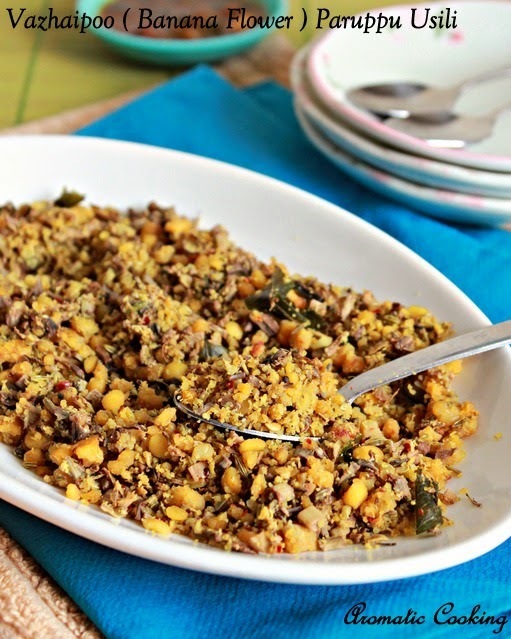 A healthy and tasty side dish to go with rice and vatha kuzhambu, moru kuzhambu or poondu kuzhambu..
Wash and soak both the dals together for about an hour. Then grind it coarsely with the red chillies and fennel seeds. Cook the vazhaipoo/ banana flower with the turmeric powder and some salt, cover and cook, adding very little water, about 1/8 of a cup. Once it's cooked ( about 7 to 8 minutes ), open and cook till all the moisture is gone. Heat some oil, add the mustard seeds, once it starts spluttering, add the curry leaves, followed by the ground dal and a little salt. Saute it well, till the dal looses all the moisture and gets a dry and scrambled look. 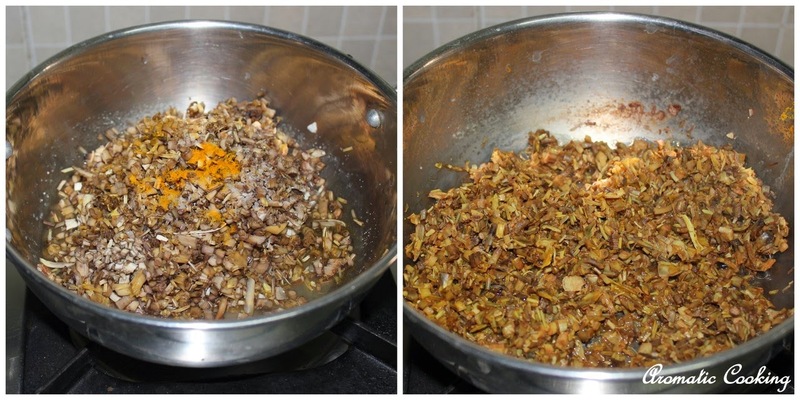 Then add the cooked banana flower and mix everything together for another 2 minutes and remove. Cleaning vazhaipoo takes some time, we have to remove the outer big brown petals, you'll see a bunch ( these only mature into bananas ), between each of the brown petals. We have to clean these small ones, remove the center thick stem and the onion like thing. This may sound a little complicated, I'll soon update about this with pictures. 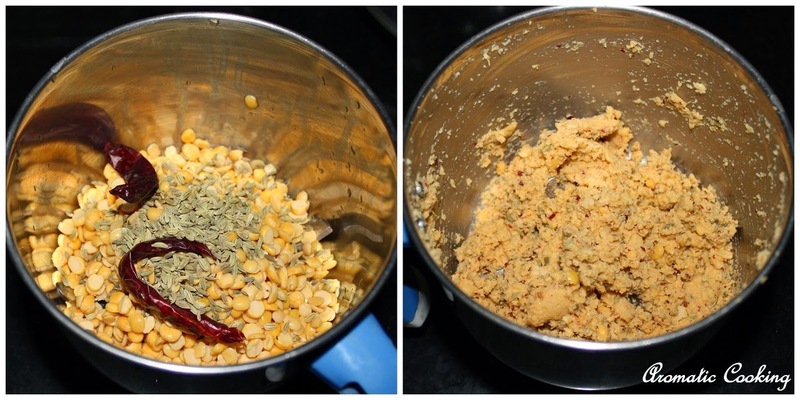 While grinding the dal, add very little or no water. Use a well seasoned pan for sauteing the ground dal, it might take a little more oil than a regular curry. I used a small vazhaipoo/ banana flower for this. Tasty and healthy .....looks interesting ! my fav usili.. I can have this snack..
healthy usili, looks very delicious..
Its been a long i have vazhaipoo paruppu usili, love simply with rasam rice. classic and delicious curry.. looks too good!